Electric dreams: which mid-size EV should you go for? Back in 2006, Sony released Who Killed The Electric Car?, a documentary film suggesting that the US government and big businesses were conspiring to keep cars burning oil. It was premature. Five years on, interest in electric cars had been revived to such an extent that a follow-up film, Revenge Of The Electric Car, was released. Around the same time, the UK government introduced the Plug-In Car Grant, subsidising every electric vehicle by £5,000. Today, BMW, Renault, Nissan, Toyota, Tesla, Citroën, Peugeot, Kia and others have electric cars that make the 1997 Toyota Prius (the first mass-marketed hybrid petrol-electric vehicle) look positively Jurassic. The promise is of cheap power, zero emissions (depending on where you get your juice from), effortless acceleration and whisperish refinement. But there are downsides to this new technology, too: namely cost, range anxiety, battery life and the time it takes to charge the things. Electric cars remain something of a niche proposition: of the 1,376,889 UK vehicle registrations in the first six months of 2015, just 4,681 were electric. Yet that represents an 83 per cent jump over 2014's figure, proving that the public are warming to the e-mobility revolution. Technology is evolving to make electric cars a better fit for our lives, and charging stations continue to proliferate at workplaces, forecourts and retailers. The cheapest car in this test, the Zoe's maximum range has just been extended to 149 miles. It features a Chameleon charger that adapts to available power supplies, and it also comes with a free 7kW wallbox charger. The i3 boasts a unique carbon-fibre construction and sci-fi looks, while an optional range-extender petrol engine relieves range anxiety. It's one of the more luxurious electric cars, and the price reflects that. The UK's best-selling electric car, the Leaf kickstarted the v2.0 e-mobility revolution back in 2011. It's had a series of recent tweaks, but will they be enough to keep it up to speed with fresher competition? Stylistically, which of our three contenders is in the driving seat? The Renault Zoe is loosely based on the Clio supermini, albeit re-engineered with different suspension and the requirements that come with switching internal combustion for electric motion. It's an attractive car, and its crisply contoured bodywork, wraparound headlights and turbine-style alloys will appeal to the fashion-conscious 20-somethings who drive Citroën DS3s. There's nothing radical about the Renault's cheap-feeling interior, but a sprinkling of future stardust – a printed circuit-board logo, some gloss-white trim, attractively sculpted seats – does lift it. The BMW i3 is not built like normal cars. You sit in a radical, carbon-fibre-reinforced- plastic (CFRP) passenger cell that's so strong you don't need the B-pillar that stretches from floor to roof in the middle of most cars. CFRP also helps make the i3 the lightest car on test at 1,270kg. The passenger cell is then attached to an aluminium chassis, which houses the electric drivetrain. It's a radical solution that's mirrored by the exterior and interior design. There are enough clues – kidney grilles, twin headlights – to let on that this is a BMW, but the i3 looks like it's been teleported from 2040. Inside, there's some familiar switchgear, but the sustainable materials – everything from 'climate' wool to recycled plastic and eucalyptus – floating, iPad-like displays and the absence of a centre console that means you can slide from driver to passenger seat, make this an enjoyably alien, high-quality experience. The Nissan Leaf was the first full-size electric car to launch in Britain. That partly explains why the exterior is relatively conservative: Nissan wanted to reassure wavering buyers, not scare them with a future-pod. Inside, the Leaf feels equally conventional, and a bit disappointing: the plastics are cheap and hard, the feeling more budget rental car than state-of-the-art technology. But the seats are comfortable, there's plenty of space for five people, and the boot is large. Think practical family car, not early-adopters' plaything. The BMW i3 holds one major advantage over its rivals: the option of an additional range-extender petrol engine. It's a tiny, 647cc unit that kicks in when the battery is drained, potentially doubling your range. Drawbacks? It adds £3,150 to the price of the vehicle, and 120kg of weight (equivalent to a heavy adult and two heavy suitcases). On top of this, your car will be less eco-friendly, and you'll need to have that petrol engine – spark plugs, oil, filters – serviced regularly. It may not be an issue going forward, though: as the charging network expands and owners become more comfortable with e-mobility, it's unlikely the next-generation i3 will be offered with this add-on. Which is first for performance, handling and suspension? 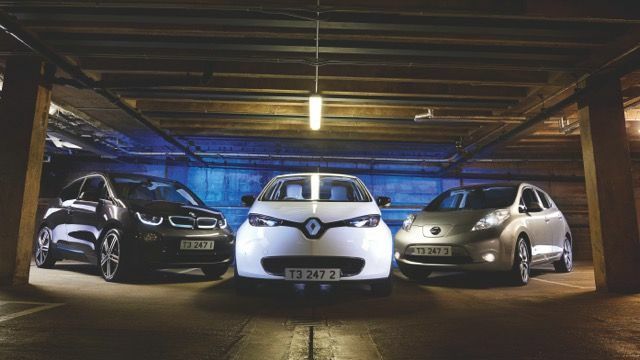 On the road, the Renault Zoe is the least polished of these three cars. The acceleration is more lethargic than its rivals (although it's still pretty nippy), the suspension is a little bumpier, and the brakes are jerky when manoeuvring into a parking space. There's also a step in the accelerator that you have to push through to get maximum poke; it discourages you from using all the available power, and makes smooth progress at speed a challenge. The Zoe is no dunce, but the others are better to drive. Following BMW tradition, the i3 is rear-wheel-drive – the only car in this test that is. This makes it the most involving car to drive. It's also the fastest. Accelerate hard and you'll ping down the road like a pinball, hitting 62mph from rest in a sprightly 7.2 seconds. The i3 is quite soft, so the suspension feels smooth and the car lolls around if you bully it from side to side, but the precise steering gives you confidence, and there's a perverse thrill to carving through corners at speed in total silence. The i3 is also incredibly refined, and it's notable that even the thrum of urban traffic struggles to penetrate the cabin. Various drive modes are available, the Eco options increasing your driving range but ultimately thwarting fun. Our test car was equipped with the optional range-extender petrol engine. It's disappointingly crude and vocal but, on the plus side, it puts an end to the dreaded range anxiety, which is a massive bonus. The Nissan Leaf rides smoothly, snuffs out an impressive amount of road and wind noise at motorway speeds, and accelerates briskly. It's set up for comfort not speed, but it's also quite agile and has nicely weighted, accurate steering, so it's fun to chuck into roundabouts. A little mouse-like gearstick enables you to switch between reverse and drive – select drive and pull back again for B mode, intensifying regenerative braking. It feels unnaturally fierce at first but helps to increase your range, and you quickly adapt. The i3 is fun, fast and refined, while the optional range-extender petrol engine deals the dreaded range anxiety a killer blow. As you'd expect from a cheaper car, the Zoe's dashboard is more functional than luxurious. R-Link multimedia and a TomTom sat nav come as standard. For a small car, the boot space is more than sufficient. And we love those space-age rear lights. The interior feels a little cheap, but the seats are soft and comfortable. No headrest for the middle passenger seems like an oversight. We tested one of the higher-end models of the i3, where flashes of eucalyptus on the dashboard add a touch of typical BMW opulence. If you opt for the range-extender, you'll soon be setting your sights on faraway destinations. Luckily, the boot will hold plenty of luggage! The leather upholstery in this model provides premium comfort. Considering it's the shortest car on test, rear leg room is fantastic. For the money, we would've expected something more refined from the dashboard, but cheap-looking plastic gives it a disappointingly budget feel. With space in the car for five passengers, they're going to need room for their luggage – and the Leaf's boot doesn't disappoint on that front. Leg room is generous, while high-backed seats and head rests ensure decent comfort for the rear passengers. As ever when buying a new car, it's worth considering how quickly the value of your EV will decrease. Parkers.co.uk estimates that after three years/30,000 miles, a Zoe (£18,445) will be worth £5,525, an i3 (£25,250) will be £11,150, and a Leaf (£21,490) £5,025. Finance deals remove uncertainty over future values and may save cash. BMW offers the i3 for three years/30,000 miles with a £5,751 deposit and 36 payments of £299 (£16,515 total). Buying it outright would cost you £14,100 based on Parkers' re-sale predictions, but the saving is cancelled out once you factor in several thousand pounds of loan interest. How battery-leasing schemes are putting EV drivers' minds at rest. The lithium-ion batteries in electric cars cost a fortune, so to give customers peace of mind, manufacturers offer generous warranties to insure against their failure. However, if you're still worried about your car's battery deteriorating over time, both Nissan and Renault offer the option to lease the battery separately (at the time of writing, BMW didn't offer this). In the case of the Renault Zoe, this reduces the retail price from £18,445 to £13,445, while the Nissan Leaf falls from £21,490 to £16,490. In both cases, you pay a monthly lease for the battery, the price of which depends on the mileage of your vehicle. Which of these is the motoring equivalent of the Duracell Bunny? Renault includes a free 7kW wallbox with the Zoe, and the car's Chameleon connector is compatible with home charging (three to four hours for a full charge), public charge points (one to eight hours for a charge, based on 22kW to 3kW chargers respectively) or 43kW rapid chargers (an 80 per cent charge in 30 minutes). It's an almost neat one-size-fits-all policy, with just the one caveat: you can now spec a Zoe that does 43kW rapid charging in 60 minutes (not 30) but gets an increase in range from 130 to 149 miles. Remember, just like official mpg figures, you'll struggle to match the maximum range claimed by manufacturers. They also say that, to prolong battery life, it's best not to regularly charge beyond 80 per cent – you can programme the cars to stop charging at this point – nor let them sink to a very low level of charge. You'll get up to 118 miles from a fully charged i3, which comes with a five-metre-long cable. At a regular household socket, BMW claims an 80 per cent charge in seven hours, or under three hours at a 7.4kW fast charger (which requires the AC fast-charge cable, £165). Hook up to a DC rapid-charge station and it'll take 50 minutes for an 80 per cent charge, though you'll need rapid-charge preparation for £560. You can also order the 4.6kW i Wallbox Pure (£315), giving you a full home charge in four hours. The Leaf offers up to 124 miles of range. With its 3.3kW, six-metre cable, you can home-charge in under 12 hours, and also use some public charging stations. But you'll want the 6.6kW on-board charger, supplied as standard on the Leaf Acenta+ but £1,150 extra on lesser specs. You can then charge in four hours at a 7kW public charging point, and get an 80 per cent charge at a rapid charging station in 30 minutes. Nissan also offers a wallbox for an eight-hour home charge at 3.3kW, four hours at 6.6kW. Prices from £195. The Zoe's range finder is a simple affair – much like the car itself. A 60-minute, 43kW rapid charge equates to (a claimed) 149 miles of driving, meaning the Zoe travels the furthest on electric power alone. There's a certain minimalist chic to the i3's range-finder display. The i3 comes with a five-metre charging cable, and BMW claims that a full charge will get you a 118-mile range. It's still the lowest in this test. We're not overly keen on the Leaf's display, which seems a little fussy. You can home-charge the Leaf in under 12 hours, so connect it up before dinner and it'll be fully fit to drive you away in the morning. The simplicity of the Zoe's charging proposition puts it ahead of its rivals, and its claimed range is also the highest of these three cars. There are over 6,500 chargers in the UK, and Nissan estimates that 96 per cent of service stations will have a rapid charger (promising an 80 per cent charge in 30 minutes) by the end of 2015. You'll need to sign up to the various card schemes to use a public charger. There are three main suppliers: Ecotricity has over 500 rapid chargers dotted along UK motorways, and they're free to use (the card is also free to apply for). Pod Point charges on a pay-as-you-go basis, giving you access to 1,200 charging points from 3kW to 43kW. Chargemaster has some 4,000 charging points, with the option of an annual subscription (£20) or pay-as-you-go. Home charging rates vary, but expect to pay £2-£4 for a full charge. Just like those used in laptops and smartphones, an electric car's battery will steadily lose performance over the course of time. The trouble is, these lithium-ion versions cost a hell of a lot more to replace than that little thing in the back of your handset. To put potential consumers' minds at ease (and ultimately to win business) electric-vehicle manufacturers are offering comprehensive warranties. BMW covers the i3's battery for eight years or 100,000 miles. Renault guarantees that the Zoe's battery will retain 70 per cent of its original capacity after five years or 60,000 miles. And Nissan guarantees nine of the 12 bars of charging capacity for five years/60,000 miles. T3 rates: The i3 packs exciting exterior and interior design, clever engineering, rapid acceleration, excellent refinement and fun driving dynamics into one compact, lightweight and highly safe package. An optional range-extender – a part-time petrol engine – will put an end to range anxiety. T3 slates: The gear selector is located behind the steering wheel, so it's a bit fiddly. The range-extender is pricey, adds weight and is noisy when it kicks in. T3 says: Nothing says you've embraced the future like the i3. It's worth every penny. T3 rates: The Zoe is affordable and has the longest claimed pure-electric range here. The Chameleon charger increases versatility. T3 slates: Could be better to drive. The interior is basic. T3 says: The perfect car for style-conscious young ones. T3 rates: Smooth suspension, effortless acceleration and impressive refinement make the Leaf an enjoyable drive. T3 slates: The gawky design and bargain-basement interior. T3 says: The Leaf is a great family car for shorter trips, but it lacks excitement. The best drivers plan further ahead than an Olympic host city. If you see a traffic light turning red, back off early – you'll avoid braking hard to stop, enabling the regenerative braking to feed back into the battery. Most electric cars enable you to programme your charging between certain hours. Ideally, you'll finish charging just before you start driving, because electric cars tend to gradually discharge once charging has ended. It'll give you a few precious extra miles, prolong your battery life and, if you're lucky, might even enable you to capitalise on off-peak rates. The more electric gizmos you use while driving, the more you'll drain the car's battery: do you really need that a/c blasting, or the stereo pumping? In winter, the drains on the electrical system are greater, thanks to lights, windscreen wipers, etc, but you can use the pre-conditioning systems if your car has them. They heat or cool the car while it's plugged in, and it's more efficient to maintain a temperature on the go than it is to adjust to one. Don't leave your boot full of stuff you don't need. Extra weight is the enemy of efficiency. The same applies to that roof box or bike rack: anything that causes more aerodynamic drag will reduce your range. As with any vehicle, a little TLC will go a long way. Make sure your electric car's cooling system is topped up at all times; it'll keep the battery, inverter and e-motor at the most efficient temperature. Let it drop and your performance will dip, range will deteriorate and battery life may suffer. And as with regular cars, you should maintain correct tyre pressures. Low pressures not only reduce tyre life and the safety of the vehicle, they also require more energy to rotate, which has an effect on range. If you want to charge your BMW i3 in as little as 30 minutes at a rapid-charging station, there's a snag: you'll need to fork out extra for rapid-charge preparation. Then again, it's much cheaper than splashing out on the range-extender petrol engine. Full LED headlights are at the cutting edge of motoring tech. They illuminate more of the road, making your night drive safer, and they use less electric charge, so they're even more efficient. Oh, and they look cool, too. You don't want to be draining your electric range stuck in traffic, so use real-time traffic information to avoid back-ups and plot the most efficient route. A hugely useful addition to the standard sat nav. What better way to listen to your favourite tunes than in an almost-silent electric car? Take full advantage with a Harman Kardon system especially optimised for the BMW i3, with 13 speakers and a 360-watt, seven-channel amp for awesome sound quality. To get a full home charge in just four hours, you'll need to specify the optional i Wallbox Pure. It provides fast charging at 32 amps and comes with a four-metre-long tethered cable. BMW partner Schneider Electric takes care of the installation, which can be either indoors or out. View the nearest charging point compatible with your car, even when you have no data connection – handy if your car doesn't have a sat nav with charge points listed. Another map, this features public stations and private owners willing to share their facilities. Users can comment on their experiences and view which chargers are in use. With these brand-specific apps, you can begin charging and activate climate control, all from your smartphone. Considering taking the e-mobility plunge? iEV monitors your driving habits, then tells you which EV will be best suited to your needs and how much you might save. Miss the thrum of internal combustion? SoundRacer OBDII pumps the sound of supercar engines through your phone. Daft but fun.